Perfectionism is a human trait. We seek to have everything perfect around us, yet we neglect the agitation and harm this causes to our mental state and spirituality. 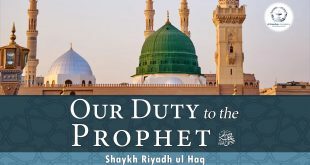 The life of the Prophet ﷺ was anything but perfect; where he was an orphan from a young age, was persecuted by his own family and suffered the loss of all his children during his lifetime except his youngest, Fatimah. Despite all of this, the Prophet ﷺ remained settled and patient. Many people seek to perfect the world around them through religion, but this is a misconception. Verses of the Quran indicate that hearts do find settlement in the remembrance of Allah, but have we truly understood the verse? This talk does well to help us understand that perfection cannot be attained in the world around us, but we should seek to perfect our inner spirit. Practical steps are mentioned to help us identify our own imperfections and prioritise on working on them first. 13:14 – Was the world ever destined to be perfect?